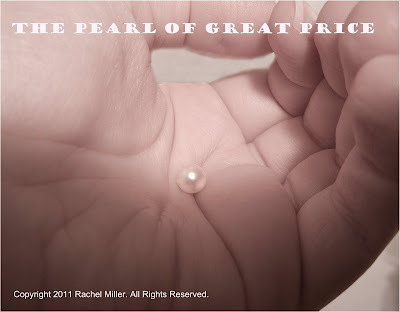 "Again, the kingdom of heaven is like a merchant seeking beautiful pearls, who, when he had found one pearl of great price, went and sold all that he had and bought it" (Matthew 13: 45, 46 NKJV). I woke up thinking about this parable, and I knew it was something God wanted me to write about today. Though it is only two verses long (one of the shortest parables of Jesus), we have an image here of Christ's heart and His mission. This merchant cherished many things. He started out seeking pearls, not just one but many. His life was full, but it was not singularly directed at any one goal. Then, suddenly, he learned of this one pearl and did what appears to be a foolish thing--he threw away all that he had and went after this one thing with total abandon. What prompted the change? I believe he saw something in that pearl that nothing else could equal--in other words, a quality that made everything else in his life seem silly in comparison. It wasn't foolishness to him to go after it with such abandon, because it was a chance of a lifetime, and he couldn't pass it up. Yet, Christ wasn't talking about merchants and pearls. He said very clearly that this is a quality of "the kingdom of heaven." We are talking about deep spiritual things, specifically, the kind of love that Christ has for us, and the kind of love He wants to see in us. We all have things that we deeply love and desire, above all other things. It could be advancement, fame, fortune, or that one secret dream (whatever form it takes), and if we get the opportunity to go after it, we will abandon everything else. If you don't think you have such a deep desire for something, then examine your life, focusing on the big decisions you have made. What did you go after? What was left behind? Adam loved himself more than God or others (even his wife and his children), and so he sought equality with God, to the loss of all other things (Genesis 3: 4-6; Romans 5: 12-15). Jesus was already equal, and deserved to be treated and respected as God, yet He chose to be a servant, despised and rejected, and ultimately thrown out with the trash. Why? Love, as Christ revealed, is a humble and self-sacrificing emotion. It isn't after something for itself; it puts all value on the object of that emotion, to the death of self. "Many waters cannot quench love; rivers cannot sweep it away. If one were to give all the wealth of one’s house for love, it would be utterly scorned," (Song of Solomon 8:7 NIV 2011), the wisest man on earth wrote. Love cannot be obscured or quenched by anything in this world, because it comes from a source above all this. It is a fruit of the Spirit of God (Galatians 5: 22-25). Jesus held this great love in His heart for us. Though we will never be as perfect as He is, He has called us to this kind of love. Jesus doesn't want us to love Him partially, still holding on to other loves that could draw us away from Him from time to time. He doesn't want us to make Him the pearl of great price in our lives, only to value another pearl greater than Him, and cast Him aside. He doesn't want us to treat our friends that way, either. He even went so far as to say that someone who didn't love his brother was not a believer (1 John 3: 11-24) and anyone that didn't care for his own family was worse than an unbeliever (1 Timothy 5:8). We are called to love with this sacrificial intensity, even if that love is scorned (Ephesians 5: 25), and we have condemned ourselves if we don't see the need for this humble servant's love in the lives of those around us. Let us love like we have been commanded--not for what we can get, but rather, for what we can give. Therefore if you have any encouragement from being united with Christ, if any comfort from his love, if any common sharing in the Spirit, if any tenderness and compassion, then make my joy complete by being like-minded, having the same love, being one in spirit and of one mind. Do nothing out of selfish ambition or vain conceit. Rather, in humility value others above yourselves, not looking to your own interests but each of you to the interests of the others. (2 Philippians 2: 1-4).